On July 27th 1949 a group of downtown merchants got together to form a Carnival Organization. The organization was called Okeanos and the Charter was in the name The Sonaeko Club, Inc. The Greek God of Rivers, Okeanos, son of Ouranos and Gaia, was the begetter of the rivers of the earth. 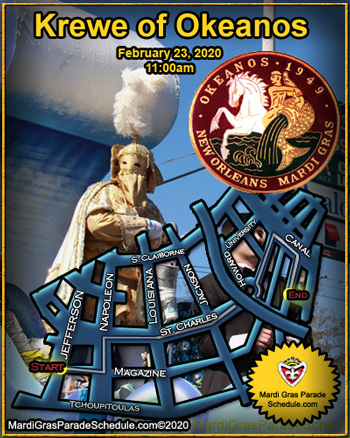 In 1950 the vigorous Okeanos directed the course of his youthful company of crewman through tranquil currents of peaceful waters and plunged them into the initial spectacle as apprentices of Carnival maasquerades. When the masked dancers retired to the watery habitats, their leader commanded them to return to present a day light procession, through a down-town route in honor of the Father of Waters.